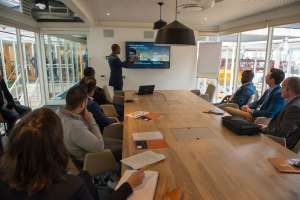 BAMAKO, Mali, March 12, 2019/ — Twenty of the most promising Francophone African tech start-ups will participate in the L’Afrique Excelle (Afrique-Excelle.com) residency in Mali, a full-week bootcamp set to kick off the Francophone edition of the World Bank Group’s XL Africa (www.XL-Africa.com), tech start-up accelerator. From March 24 to 30, entrepreneurs will have the opportunity to network and learn from leading industry experts, increase their regional visibility and network with potential corporate partners and investors. L’Afrique Excelle’s start-ups specialize in tech solutions for the African market designed to expand reach and access to services. These include fintech, transportation, healthcare, cleantech, data analytics and enterprise software. Companies in the program have their products or services currently available in one or more Francophone African markets, have strong revenues, and are well-positioned for growth and cross-border expansion. During the Mali Residency, this cohort will benefit from training, individual consultations and peer-to-peer learning, The Residency will conclude with a venture showcase at the Francophone Africa Investor Summit. A select 10 companies will advance to the France Residency in May 2019, where they will receive intensive training and mentoring at thecamp (TheCamp.fr) with Sophia Business Angels (SophiaBusinessAngels.com), coaching by experts at Deloitte’s (http://bit.ly/2TyEZ43) and Google’s (http://bit.ly/2T0p2yJ) offices, and get exposure to investors at the upcoming AfroBytes (www.AfroBytes.com) and VivaTech (VivaTechnology.com) conferences to be held in Paris on May 15-18, 2019. With participation from Africa’s leading investment groups, L’Afrique Excelle will help these start-ups attract early stage capital between US$250,000 and US$5 million. “Similar to the XL Africa program, L’Afrique Excelle has attracted a number of growth-oriented digital start-ups from Francophone Africa. Many of them have already raised seed funding, totaling over $11 million, and are active in several African markets. This is a strong signal regarding the competitiveness of Francophone African start-ups and their contribution to Africa’s digital economies,” said Sebastian Molineus, Director of the Finance, Competitiveness & Innovation Global Practice at the World Bank Group (www.WorldBank.org). The selection process for L’Afrique Excelle is led by an external investor committee. Over 30 VC funds and investment groups have come on board as official program partners, with the fund managers vetting the companies, reviewing their applications and conducting interviews. The selection was completed by a panel of industry experts from prominent Africa-focused funds including Proparco (www.Proparco.fr/fr), Orange Digital Ventures(DigitalVentures.orange.com), GSMA (http://bit.ly/2ES39MK), Brightmore Capital (BrightmoreCapital.com), BlackPearl(www.BlackPearlCap.com/BPC/), Partech (PartechPartners.com), AHL Venture Partners (www.AHLVenturePartners.com), GreenTec Capital (GreenTec-Capital.com), Outlierz Ventures (www.Outlierz.co), Accion (www.Accion.org), First Growth Fund, Compass VC (http://bit.ly/2HdMSVY) and Oikocredit(www.Oikocredit.coop). L’Afrique Excelle is powered by the World Bank Group and the Tubaniso Agribusiness and Innovation Center (TAIC) (http://bit.ly/2u0Jx41) with financial assistance from the Italian Agency for Development Cooperation (AICS) (www.AICS.gov.it/language/en/) and implemented by VC4A(https://vc4a.com), Suguba (https://www.Suguba.org) and Sahel’Innov (https://www.SahelInnov.org). For more information on the program and the selected start-ups, visit www.Afrique-Excelle.com. To attend the Francophone Africa Investor Summit, visit www.FrancophoneAfricaInvestorSummit.com.